BEASTBEAM™ Vehicle Lights are powerful LED-based electronic lighting systems based on our successful military versions. 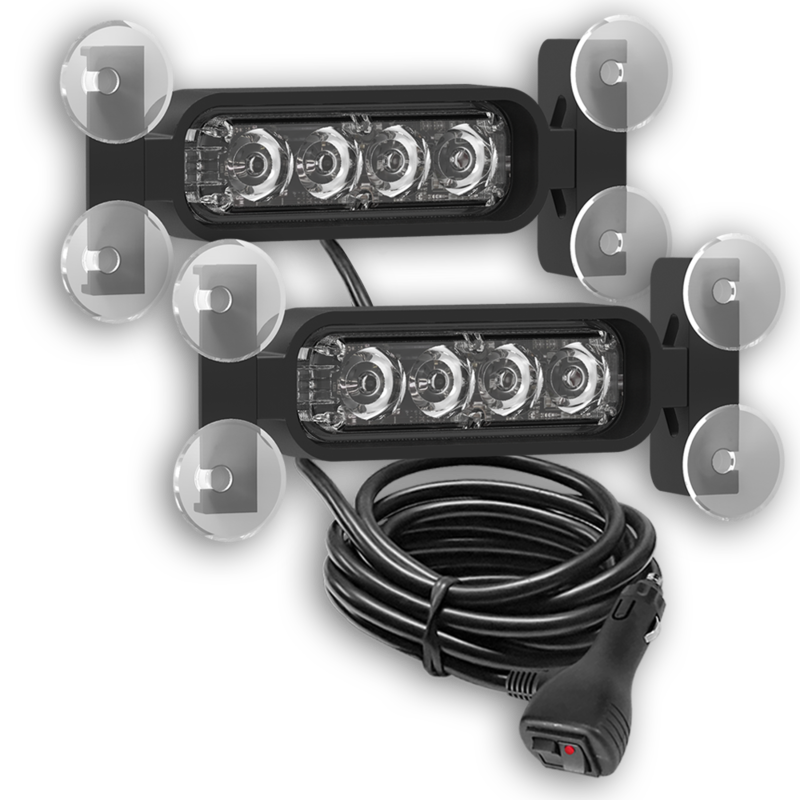 There are lights that look similar but they DO NOT compare with the BeastBeam™ in efficiency and intensity! 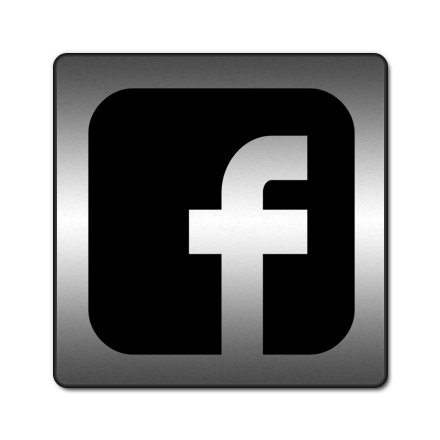 Four powerful LEDs emit a single or dual color directional light beam. These lights are low profile and produce very intense light. 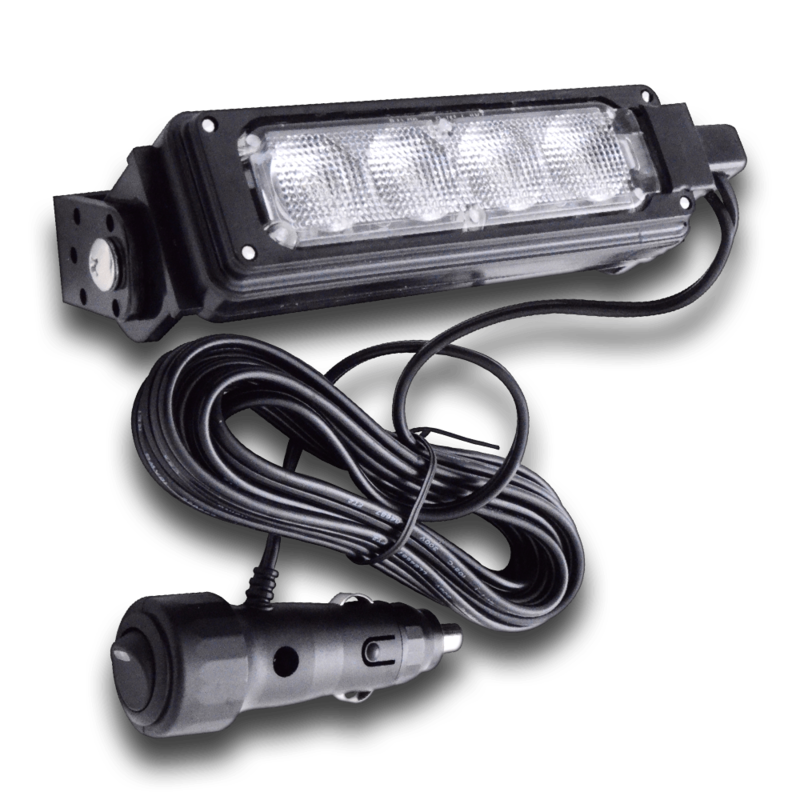 Some lights are designed for Interior use on FLAT or SLOPED Windows, while others are designed for Exterior use such as behind the grille or on a crash bar, allowing unmarked law enforcement vehicles to blend in easily with other traffic. 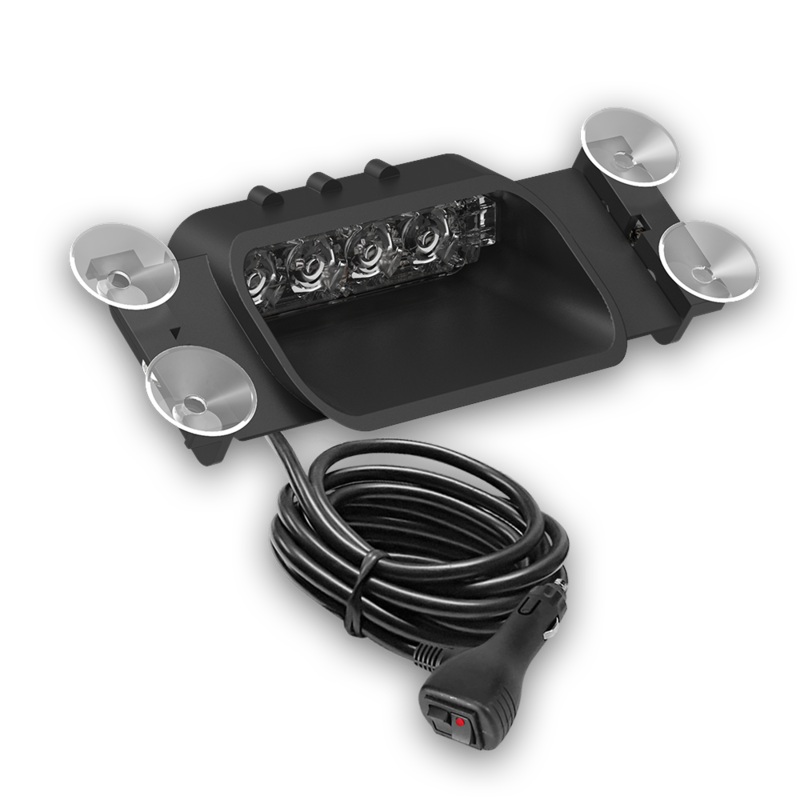 Each light includes circuitry which allows you to select any of the built in 8 flash patterns and for combining a group of BeastBeam™ lights to flash in synchronization or to alternate. Each light typically comes with 4 foot of wire for hardwiring, but is also available with a cigarette lighter plug with a built in switch, fuse and 10 feet of wire. Models purchased with a cigarette lighter plug have built in circuitry for 8 flash patterns but do not include synchronization circuitry for connecting to other lights. Selecting a model having all 4 LEDs of a single color results in a light which includes some of the 8 flash patterns having all four LEDs flash simultaneously and other flash patterns where sets of 2 LEDs of the same color are alternating. Models having 2 LEDs of a first color and 2 LEDs of a second color have flash patterns which are always alternating between colors. 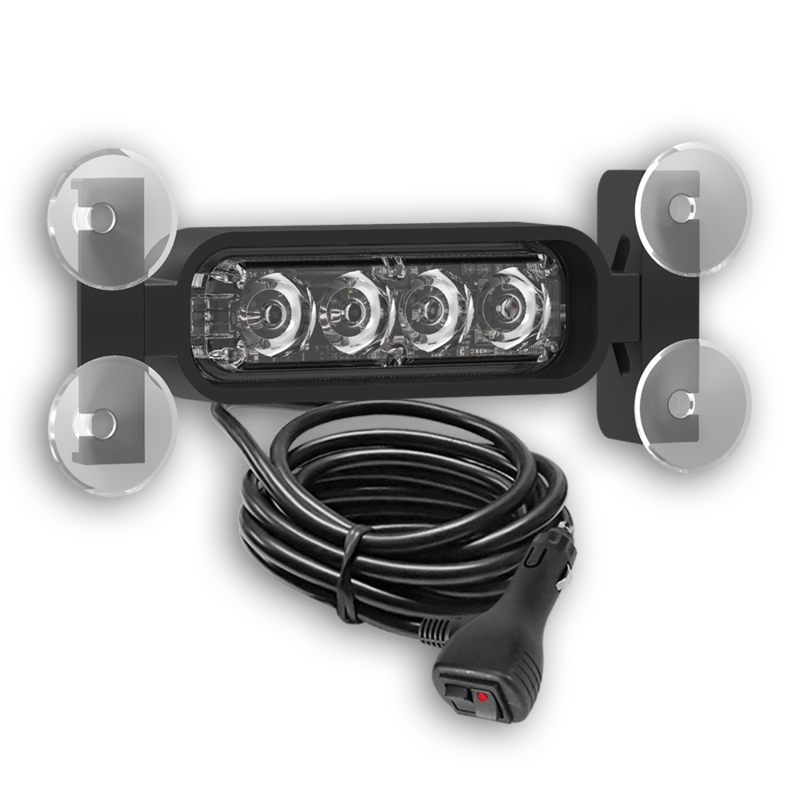 For vehicles which require two lights to be mounted spaced apart on the same vertical window (such as a rear window) we have models which greatly facilitate the installation by incorporating 2 identical lights interconnected with 4 ft of wire. Model 2404 BeastBeam™ Exterior 12 VDC Vehicular Warning Light with Powerful Magnets for attaching to a steel Surface including Adjustable UP/DOWN Bracket for Aiming, (4) Powerful LEDs, (8) Flash Patterns, Synchronized Flashing when used with similar Model lights, Single or any Two Color Light Beam, Stainless Steel Fasteners, Waterproof Housing, Cigarette Lighter Plug, 10 ft. Wire, built-in Switch and Fuse. Model 2510 BeastBeam™ Interior 12 VDC Vehicular Warning Light for Vertical Side/Rear Windows including (4) Powerful LEDs, (8) Flash Patterns, Synchronized Flashing when used with similar Model lights, Single or any Two Color Light Beam, Waterproof Housing, (4) Suction Cup Rubber Mount, Cigarette Lighter Plug, 10 ft. Wire, built-in Switch and Fuse. 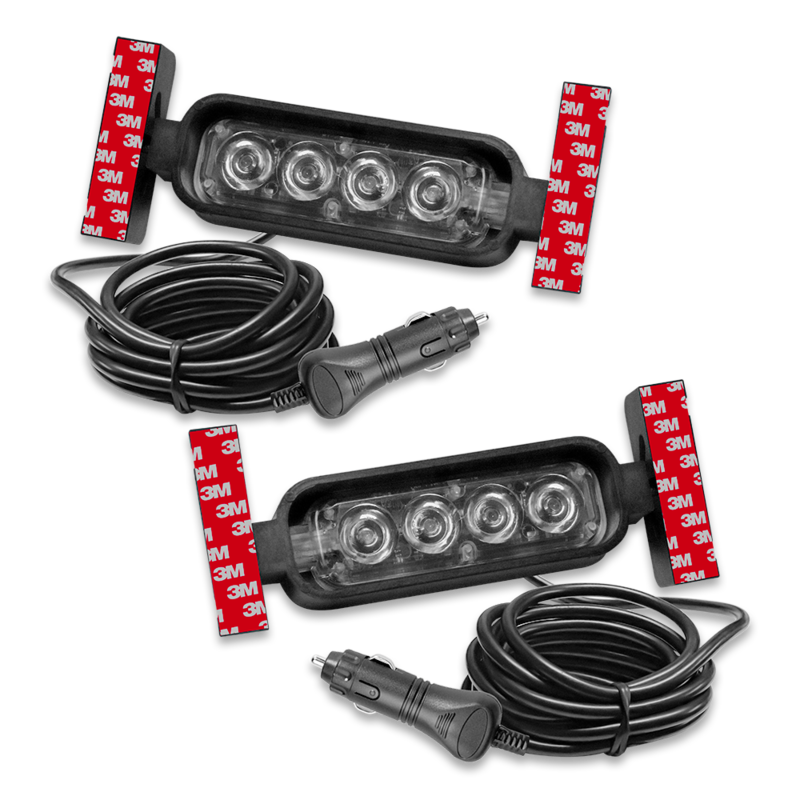 Model 2530 BeastBeam™ SET of (2) Interior 12 VDC Vehicular Warning Lights for Vertical Side/Rear Window including Pre-wired with 4 ft wire between lights, Each Light having (4) Powerful LEDs, (8) Flash Patterns, Synchronized Flashing when used with similar model lights, Single or any Two Color Light Beam, Waterproof Housing, (4) Suction Cup Rubber Mount, Suction Cup Adhesive, Cigarette Lighter Plug, 10 ft. Wire, built-in Switch and Fuse. Model 2000 BeastBeam™ Interior 12 VDC Vehicular Warning Light for Sloped Front/Rear Window including (4) Powerful LEDs, (8) Flash Patterns, Synchronized Flashing when used with similar Model lights, Single or any Two Color Light Beam, Waterproof Housing, (4) Suction Cup Rubber Mount, Cigarette Lighter Plug, 10 ft. Wire, built-in Switch and Fuse.